Luke Boudreau graduated from St. Mary’s University with a Bachelor of Science degree in 1994. He obtained a diploma in French language a year later from the Université Ste. Anne and was attending Ryerson University in the Occupational Health and Safety program before being accepted into the Doctor of Chiropractic program at the Canadian Memorial Chiropractic College in 1995. After graduating in 1999, Dr. Boudreau continued his education as a clinical sciences resident with a focus on occupational health and safety. In 2008 he completed the Contemporary Medical Acupuncture Program at MacMaster University. He also graduated from the Master of Health Administration Program at the University of Regina. 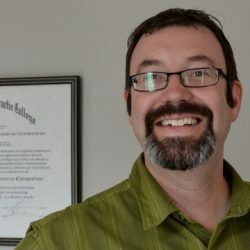 Dr. Boudreau has been active in research and has published several articles in numerous peer reviewed health science journals on workplace injuries, ergonomics and patient satisfaction of chiropractic health care. Clinical experience includes an internship in the out-patient department of St. John’s Rehabilitation Hospital in Toronto. He completed a clinical rotation as part of a residency program at the wellness centre of the Husky Plastics Injection Molding Systems plant in Bolton. Delivering on-site patient care for the employees, he also performed ergonomic assessments and consulted on work-related injury prevention for the corporation. He then moved to Nova Scotia where he worked as a resource clinician and researcher at the Archie McCallum Hospital at Canadian Forces Base Stadacona. In Halifax, he also served as a consultant for Renova Integrated Health participating in treatment of motor vehicle accident and worker compensation cases. During the four years prior to 2005, Dr. Boudreau served as Clinic Director for Advanced Rehabilitation in Toronto. Currently, he works at the at CareWell Health Group and is an adjunct professor at the University of Guelph. He enjoys a collaborative care relationship with numerous family physicians and allied health professionals in the building and surrounding area.